Are you a Human or a Cyclone? Well I meant to say if you like the Human side or the Cylon side of the coaster more. Battlestar Galactica, the tallest dueling coaster is a gem in the world of coasters, despite all the problems that happened in the past year. 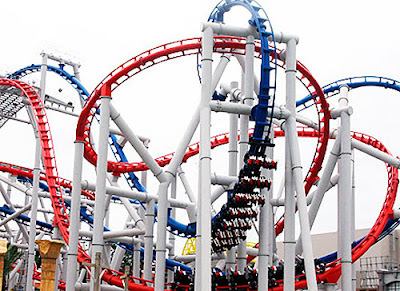 Manufactured by Vekoma, Battlestar Galactica is a cross between a sit down coaster and a suspended inverted coaster, with cars launching from zero to ninety kilometers per hour, with a top height of 42.5 meters. Based on the hit television series, Battlestar Galactica the ride follows the storyline of the battle between Humans and Cylom, with the riders being recruit fighters embarking on their aerial fighting mission. Guests will need to be at least 125cm tall to ride. This ride is an extreme motion ride which includes sudden and dramatic acceleration, ascends, falling and inversions(Cylon). While there is no age limit or requirement, each child must sit on their own seat (no sitting on parent’s lap or carried by parent) for the entire duration of the ride. Do note that guests prone to motion sickness, dizziness, giddiness and so forth should be aware that this is a high speed coaster ride. The movement of the coaster is dynamic, including sudden tilting, spinning and sharp movements. There are 2 ways to shorten your waiting time. The easy way (which requires extra payment) is to buy a Universal Express pass, the other is to use the Single Rider line. Present your Universal Express pass at the entrance, then at the loading platform. One-use at this attraction. There is usually no queue at this line, and even if there is, the crew members are supposed to serve Express Passholders first. This is practiced is most situations. Waiting time estimated to be 0 to 10 minutes. Please note that you will not be allowed to bring on any loose items onto the ride. Free locker service (for approx 30 mins - will adjust depending on queue) is available outside the attraction. Please remember to deposit you items or you will be turned down at the entrance. Keep your feet and arms inside the coaster at all times when it is in motion. Do not attempt to take photos or videos during the ride. Battlestar Galactica coaster starts off in the plaza area of Sci Fi city. 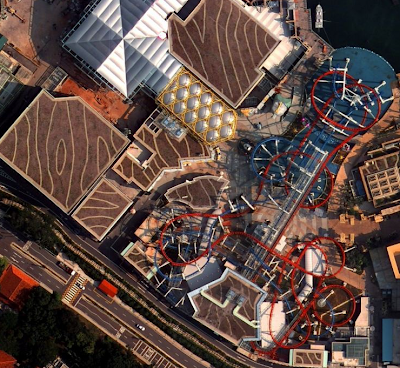 The entire length of the coaster goes above the plaza, as well as the lagoon in front of the plaza. This area is a highly vibrant and lively one, where guests just gather and watch the coaster. There are two separate entrances to the two sides of the coaster, and both coaster exits to the gift shop in the center. The queue for this ride starts off at the right side of the plaza. The queue meanders through an outdoor section, which is located directly under the track, before going into the indoor queue section. The indoor queue section is meant to mimic the battle facility of the human, with a small hanger containing a replica of a space plane. There are also mock videos for spurring the Humans on playing on the monitors. The queue heads up a level, to the second level loading area. Along the staircase, there are wartime posters detailing how bad the Cylons are. Some interesting items include personal photos that are placed in the "soldier lockers". The trains come out of the loading bay, and head straight for the LIM launch. The coaster is launched alongside with the Cylon side, hence guests will be able to see other guests on the other car. The coaster then heads for its first drop, with is also the steepest, and this is where the train pulls the maximum G-forces. The G-forces are great enough to cause grey-outs on several riders. (*A grey-out may be experienced by pulling high positive g-forces as when pulling up into a loop or a tight turn forcing blood to the lower extremities of the body and lowering blood pressure in the brain.) The train then heads towards a huge 180 degrees banked turn before heading for a dip and a slight left banked turn. This is followed by a right banked turn over the launch tracks, and a sharp left turn, before heading over a mist pit. The coaster then enters into a upwards spiral section, before heading back to the loading station. Riders exit and are directed down the stairs into the gift shop, where they will be able to purchase their on-ride photos. This is a suspended coaster, which means the tracks are above your heads, and that there is no floor beneath your feet. This coaster is much more intense, due to the presence of inversions, but it pulls less G-forces and seems to go at a slower pace between the elements. Riders enter the queue and meander through the outdoor section of the queue. The queue then heads indoors, into the Cylon nerve center. The decor here is much more on the cool palette than the Human side. The atmosphere is much more surreal here. Guests are greeted with a interesting installation where Cylon guards positioned in front of mirrors seem to stretch on for eternity. Other decor in the first level of the queue includes a circular queue chamber with blue lighting effects. The queue then moves up to the second story. The decor around the stairwell is themed to be like an organic machine, where wires and cables seem to grow and morph out of the walls. This decoration is highly surreal, and really captures the mood for this part of the ride. The coaster starts off at the launch station and heads for the high speed LIM launch. The coaster is launched alongside with the Human side, hence guests will be able to see other guests on the other car. The coaster then heads straight for a outwards loop. The coaster then heads into a banked right turn and then cobra roll, before heading for another outward loop. This then transitions into a corkscrews roll, before the train returns to the station. This is a great ride for Universal Studios Singapore; it adds to the mix of attractions. It is nice to see a ride based on an Intellectual Property as famous as Battlestar Galactica premier in Singapore. This is a great ride if considered as a coaster, though it lack theming elements and an immersive story. Just went on human going on Cylon next time!!!!!!!!!!!!!!!!!!!!!!!!! !